LumiLor is a patented Light Emitting Coating (LEC) system which allows anything coated with it to illuminate. LumiLor works with electroluminescence which simply means that an object is capable of emitting light when an electrical current is applied to it. Watch this overview of how LumiLor works. 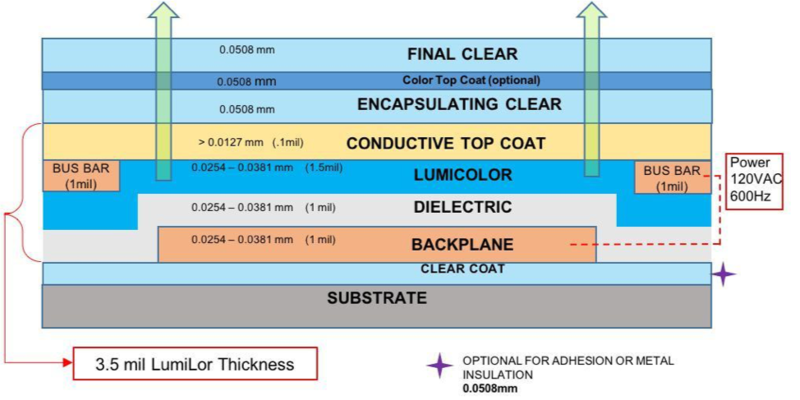 LumiLor is a multi-layer, sprayable, electroluminescent coating system consisting of backplane, dielectric, LumiColor, busbar, and Conductive Top Coat. Collectively the entire application is known as The LumiLor Stack. Backplane - Highly conductive low resistance material that allows the electrical current to be supported across the entire illuminated surface. Dielectric - Insulation layer when applied over the backplane and under the busbar to insure there is no burning or shorting of the system. LumiColor - Large particle material which emits light when under power. Busbar - Backplane material that provides a low resistance path for better distribution of electrical current. Conductive Top Coat - Translucent conductive material sprayed over the entire surface which allows the electrical current to be distributed to produce light. Encapsulating Clear - Automotive grade speed clear coat to protect LumiLor from elements, contamination, and ultra-violet (UV) rays. It also encapsulates the electrical current within the LumiLor system to protect from electrical shock and provides a surface for optional Color Top Coat. Color Top Coat (optional) - The raw color of LumiLor when power is off is similar to a gray primer. Automotive grade pearl, candy, or over-reduced pigmented colors can be applied over the encapsulating clear coat to produce a desired color when the power is turned on or off. Artwork can also be applied over LumiLor including hydrographics, spray chrome, airbrush, vinyl wrap, etc. What Color is LumiLor when Lit and Unlit? LumiLor is available in eight native colors, these are colors you see when LumiLor is lit. Green, Aqua, Blue, White, Orange, Yellow, Violet, Pink. LumiLor appears as a gray hue, similar to an automotive primer, when unlit. Topcoats (airbrushing, tinted clear coats, colored top coats, hydrographics, etc.) can be used to alter the appearance of LumiLor to create a desired effect. What about red? You want red LumiLor, we want red LumiLor, everyone wants red LumiLor. Red tones can be achieved by top coating LumiLor with tinted clear coats or colored top coats such as candies and pearls, or even with hydrographics. This is typically applied over white LumiLor to provide the most true color effect. Always test top coats on a sample to see how they will look. LumiLor emits light and anything placed over LumiLor will absorb a certain amount of light from emitting. Depending on your desired outcome this may be good (you want to eliminate light in a certain area) or bad (you want the light to shine through). Experimenting with with various top coats and techniques will help you get your ideal level of opacity or transparency. What Can LumiLor Be Applied To? Adhesion promoters can be used on a substrate but must have automotive clear applied over it before the LumiLor application begins. Click here for specific instructions on substrate preparation. How Long Will LumiLor Last? 'Half life' is not an indication of total useful life. LumiLor will degrade in brightness up to the half life, and then plateau. There are documented applications of electroluminescence using materials identical to the main components of LumiLor where the useful life of the product has been measured over 10,000 hours, and in some up to 50,000 hours. Understanding some basics of electronics is helpful when using LumiLor. Current - LumiLor requires alternating current (AC) to produce light. Direct current (DC) can be converted to AC with the use of an inverter. Batteries - Batteries provide direct current which can be converted to alternating current with an inverter. Voltage - LumiLor typically runs on voltage between 100V AC and 200V AC but has the capacity to run on voltage between 80V AC and 400V AC. Frequency - LumiLor typically runs at a frequency of 400Hz to 1000Hz but has the capacity to run between 50Hz and 2000Hz. Inverter - An inverter converts DC to AC. Boost Converter - A device to increase 12V DC in and output up to 30V DC. Power Consumption - LumiLor consumes approximately 1 milli-amp per square inch. Electronics and light output - Variances in frequency and voltage affect the brightness and longevity of LumiLor. Car batteries - LumiLor can run directly off of a car battery with the use of an inverter. Special consideration should be taken in designing the electronics (i.e. connecting to a separate fuse). What About LumiLor Research and Development? We have invested over $4,000,000 in testing and certifying LumiLor to assure that, when properly applied, your paint job remains bright, and does not crack, peel, or delaminate. LumiLor is subjected to the harshest standards an automotive basecoat is asked to endure. We have demonstrated the ability to pass ASTM G154, where UV light and water vapor rapidly weathers a panel. We have run this test for over 400 hours without incurring a loss in brightness, adhesion, or film quality. We have also demonstrated LumiLor can pass ASTM D3359, where we test the adhesion of the film when the film is damaged through both an X test and a crosshatch. We actually go beyond the test method, and soak the panels in water for 24+ hours prior to applying the tape and testing the adhesion. In all circumstances, a properly applied LumiLor system can pass these enhanced tests without issue. Note that we cannot certify LumiLor to these standards independently. Substrate, application, and topcoat as a system must be tested in order to certify the coating for an application.